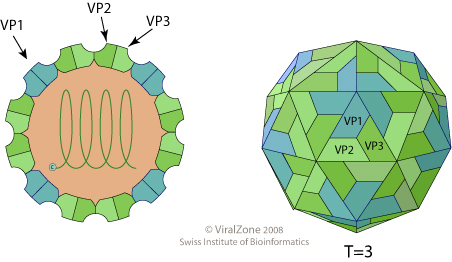 Non-enveloped, T=pseudo3 icosahedral capsid, about 25nm in diameter and composed of 60 trimers of VP1-VP2-VP3 proteins. Monopartite, linear ssRNA(+) genome about 8.6 kb in size. 3’end is polyadenylated. The virion RNA is infectious and serves as both the genome and viral messenger RNA. The polyprotein is processed presumably by several proteases.